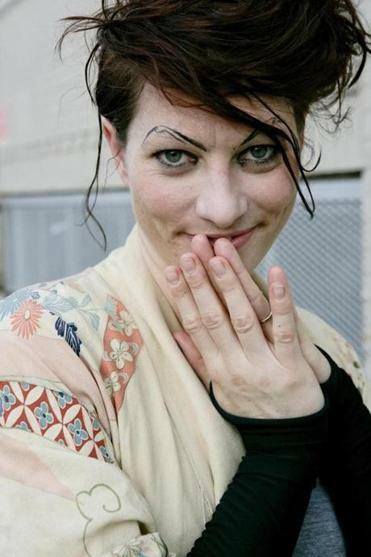 Dresden Doll Amanda Palmer and her husband, “American Gods” writer Neil Gaiman, are lending their celebrity to Katherine Bergeron and E. Stephen Frederick’s campaign to restore a Dorchester firehouse and turn it into an art space. Palmer (inset) and Gaiman will perform at a Dec. 21 benefit for Bergeron and Frederick’s Torrent Engine 18, the 1869 firehouse they bought to house artists and Frederick’s Empire S.N.A.F.U. Restoration Project, which Bergeron describes as “an otherworldly multimedia, sculpture, and performance art project.” Bergeron and Frederick are running a Kickstarter campaign to raise money for the space and are already up to more than $17,000 (they had a $10,000 goal). Those who donate $125 to the cause get themselves a ticket to the December gala, which is being held at a secret spot in Dorchester. Bergeron — who’s also known around town as performer Katrina Galore — told us that Palmer and Gaiman signed up to help because Frederick has known Palmer since she was 19. She’s participated in his performance art and has always been a fan of Empire S.N.A.F.U. Bergeron said that during the gala, “Neil is going to do a reading or two, and Amanda is going to do a piano and ukulele performance.” On her Kickstarter page, Bergeron jokes of her two famous friends that “if, by some chance, you have no idea who [Palmer and Gaiman] are: my condolences on your unfortunate incarceration.” As of Thursday afternoon, there were still 67 (of 140) available passes to the party. The Kickstarter campaign ends Friday.